Next Generation appliances for better living. Intirion Corporation has been providing the federal government with residential and commercial appliances since 1989. 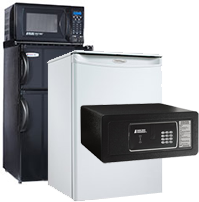 From our own MicroFridge combination appliances to offering major brands such as Maytag, Whirlpool, American Dryer and many more. We are a Small Business located in Foxboro, MA. Intirion Corporation is proud to bring excellent customer service, offer the best warranty in the industry, and the most comprehensive product selection at discounted government pricing. 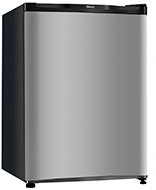 Our award winning MicroFridge combination appliance with Safe Plug and smoke sensor and other TAA approved products are available via our GSA Contract – (47QSHA18D001Y) and can be purchased through GSA Advantage or by ordering via AFNAF – Air Force Non-Appropriated Funds. GSA Advantage provides the most convenient one-stop shopping source to meet all your procurement needs. with NEW 1st Defense™ Smoke Sensor. Helps prevent fire alarms for things like burnt popcorn. with NEW USB Charging Station. Free up electrical outlets and let everyone charge their mobile devices. Use half the electricity of separate appliances and reduce the risk of fire hazards with Microfridge’s patented current limiting technology. Patented power management system designed to reduce energy use and increase safety. This innovative technology utilizes one plug to the wall operation and uses just 11-13 amps of electricity. Strongest 10-Year Industry Warranty with on-site service. No need for special wiring, even in older buildings. The MicroFridge®/Intirion division also services the military and government market with energy-efficient Maytag commercial laundry equipment, as well as Maytag residential appliances. For more information on MicroFridge®/Intirion products and programs, please call 1-800-637-7567 or request information online.